We are a leading Manufacturer of industrial asbestos webbing tape, asbestos webbing tape, customized asbestos webbing tape and non metallic asbestos webbing tapes from Ahmedabad, India. 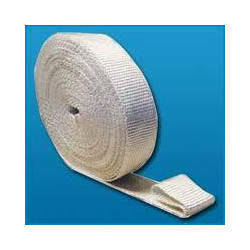 We have gained expertise in offering a wide assortment of Industrial Asbestos Webbing Tape. 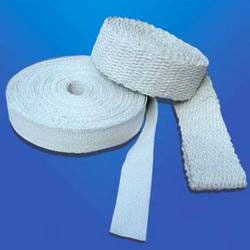 Our customers can avail from us superior quality Asbestos Webbing Tape. Asbestos webbing tape are efficacious for general steam glands insulation, hot blast valves, boiler lagging & sealing of oven, blue cap doors, and furnace joints. Asbestos tapes are used for insulating wires, coils, cables and other electrical conductors. Asbestos tape are also used for insulating small steam pipes and bends, as a flexible gasket material and to form flexible connecting couplings where high temperature service is involved and as wicking in oil-burning apparatus. Packaging Details: Size (Thickness): 25 mm to 75 mm of thickness 3 mm & 6 mm respectively * 10kg standard packing. 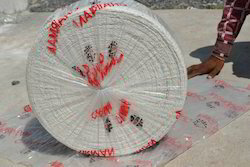 Our company has carved a niche in the market for the manufacture and import of a wide range of Customized Asbestos Webbing Tape. Insulating wires, coils, cables and other electrical conductors. Insulating small stream pipes & bends, as a flexible gasket material & to form flexible connecting couplings. For wrapping around various heat insulation pipes. We offer a wide range of Industrial Asbestos Webbing Tape that is used for sealing components in manufacturing equipment, handling high temperature instruments and heat. Asbestos webbing tape are manufactured using technically advanced materials in compliance with international quality standards. They are durable and economical, high in water repellent, low in water absorption, resistant to flame, heat, oil, fungus and mold, non-corrosive to cables, non sagging and abrasive resistant. Our range of Asbestos webbing Tape and Rope offers consistent services for longer period of time and is used in heavy machinery industry. Because of their excellent electrical and heat insulating properties and high tensile strength this asbestos webbing tape comes open up a new horizon of applications. Edges of the webbing tape are selvage so that the threads cannot pullout. Asbestos tape are handy and so can conveniently be carried anywhere at anytime and used right on the spot of work. 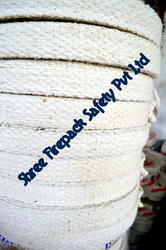 We are a prominent Non Metallic Asbestos Webbing Tapes Manufacturer and Supplier based in India. 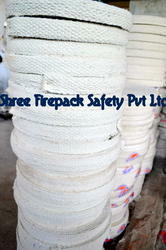 Asbestos Webbing Tapes offered by us are made using woven around asbestos yarn that does not loosen while service. Asbestos cloth tapes with good quality resilient heat proofing is available in the continuous roll form as well as folded coil form. Asbestos cloth and tapes, due to good flow characteristics are excellent sealing materials particularly where the flange surfaces are not machined and uniform. Asbestos tapes goods are expected to yield under minor pressures to conform to uneven and rough surfaces to offer a perfect seal. Further the Asbestos tapes goods used under high temperature conditions allow compound to resist and provide a hard joint for efficient sealing. An all purpose jointing material for sealing manholes, hand-holes and inspection covers on boilers, tanks and pressure vessels, retort doors and other applications against air, water, steam and mild alkalies. Asbestos tapes is specially recommended for sealing doors of hot ovens and fireproof safes, hot air ducts, panels and cowlings, etc. 25 mm to 100 mm of thickness 3 mm & 6 mm respectively.